Located in Philadelphia, Pennsylvania, the Barnes Foundation is an art museum and educational arts organization, showcasing more than 4,000 historic works of art by notable Impressionist, Post-Impressionist, and Modernist artists. The Barnes Foundation was the vision of Albert Coombs Barnes, a chemist known for his invention of the silver-based antiseptic Argyrol. As a lifelong lover of the arts, Barnes began amassing a substantial visual art collection in 1912 with the help of his former classmate, painter William Glackens, who acquired 30 important European works for Barnes, including The Postman by Vincent Van Gogh and Young Woman Holding a Cigarette by Pablo Picasso. Throughout the following years, Barnes and his wife Laura continued collecting works by Impressionist, Post-Impressionist, and Modernist painters, along with a variety of indigenous, historic, and modern American and African decorative art pieces. In 1922, the couple purchased a 12-acre arboretum facility located in Merion, Pennsylvania for the purposes of constructing a personal residence and museum facility for displaying their collections, and later that year, received a charter to create the Barnes Foundation for the purposes of promoting public education on fine art and horticulture. In March of 1925, the first Barnes Foundation facility officially opened to the public. The Barnes Foundation was originally conceived as an art educational school facility instead of a standard museum, with educational programming taught in collaboration with Columbia University and the University of Pennsylvania. In 1961, the facility’s permanent art collection was also opened to the public as a museum exhibit. Throughout the 1990s, the museum’s collections embarked on a world tour to cities such as Toronto, Canada and Tokyo, Japan, as an attempt to raise funding, but even though the tour was a major success, more funding was needed to continue museum operations. After a number of legal battles in the early 2000s, the Foundation successfully acquired a facility in Philadelphia’s Benjamin Franklin Parkway civic corridor for the purposes of displaying its collections as a permanent public-admission-funded art museum. The new museum building’s construction broke ground in 2009, and in 2012, the new Barnes Foundation museum was opened to the public. Today, the Barnes Foundation is operated as an art museum and arts educational facility, striving to promote arts and horticulture appreciation through a variety of exhibits and public programming. All educational programming at the Foundation is based around Barnes’ original teachings, principles, and collections. The 12,000-square-foot Philadelphia gallery is designed to evoke the original layout and concept of the Merion facility, showcasing similar Japanese maple and cedar trees on its grounds, which are framed by an Ellsworth Kelly abstract sculpture and reflecting pool. A specially-commissioned triptych by Henri Matisse, titled The Dance II, is also preserved from the Merion location. More than 4,000 works of rare and master art are held by the museum’s collections, valued at over $25 billion in total. The collection is primarily focused on the works of notable Impressionist, Post-Impressionist, and Modernist artists, including an impressive number of holdings by artists such as Pierre-Auguste Renoir, Paul Cézanne, Henri Matisse, and Pablo Picasso. 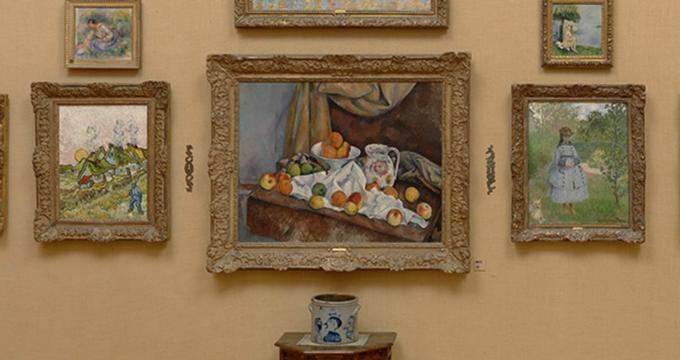 Notable works in the collection include van Gogh’s Still Life, Matisse’s Still Life with Gourds, Cézanne’s The Card Players, and Picasso’s Acrobat and Young Harlequin. Works by African and Native American artists are also displayed, as well as antiquities from ancient Egypt, Greece, Rome, and China and decorative arts works by American and European artists. All pieces are arranged as part of Barnes’ wall ensemble philosophy, which contrasts pieces from varying time periods, regions, and mediums. In addition to the Philadelphia gallery space, the original Merion location is now open to the public as a 12-acre arboretum facility, featuring a variety of plant collections assembled by Laura Barnes, including magnolias, lilacs, roses, hostas, ferns, and medicinal plants. Visitors may tour the facility as part of guided tours and may use its horticulture library and herbarium for research by appointment. Periodic horticulture classes are also offered. Guided tours of the Barnes Foundation are offered for small groups and organizations, including curriculum-incorporated tours for elementary and secondary students. Tour packages include a one-hour Daily Highlights tour structured for first-time visitors, a private Daily Premier tour offered during hours the museum is closed, and personally-structured docent-led tours. A variety of special rotating temporary exhibitions are also offered at the museum, featuring events and receptions for exhibit openings. Public courses, workshops, and certificate programs are offered on a variety of art and horticulture topics, including a Horticulture Certificate Program, an Art in Context series, and teachings using the Barnes Method. Periodic public special events are also offered for visitors of all ages, including a film series, family storytime events, Noontime lectures, In Focus gallery talks, First Friday concerts, and First Friday family social events.